Market researchers no longer have to deal with the organizational pain points of dealing with qualitative assets: with Glide Central™, project managers can upload video, audio, and images to a central repository, sorted by individual project, where they can search, retrieve, clip, and share audio and video for streamlined analysis and reporting. The Glide Central™ platform also enables market researchers to generate automated transcripts that they can manually edit and copy and paste to supplement their projects. Upload of human-generated transcripts is slated to be released soon. 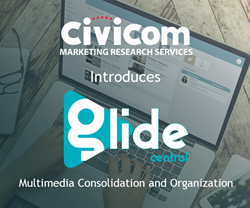 As a full-service market research services provider, Civicom continues to develop solutions that empower market researchers to derive key insights through the powerful combination of innovative telephone and web-enabled market research solutions and excellent customer service. More information on Glide Central™ can be found here. Interested parties are also encouraged to request for a demo of the solution by filling out this form.